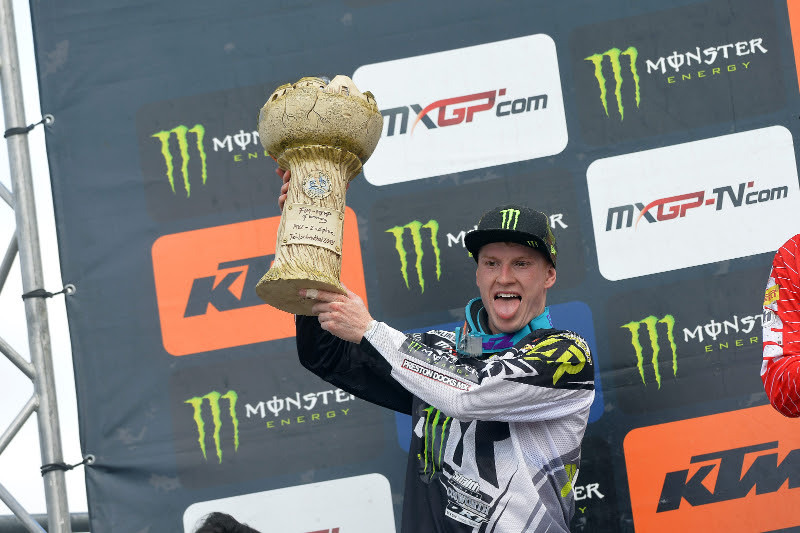 Max Anstie at last was able to capitalise on a holeshot, win a moto and walk the MX2 podium by going 8-1 across the hard-pack of Teutschenthal for the Grand Prix of Germany and the tenth MXGP meeting of the season for the Monster Energy Dixon Racing Team Kawasaki crew. 32,000 fans entered the ‘sunken’ circuit – surrounded by steep spectator banking areas and littered with tight off-cambered turns and short climbs and drops – as the 2015 campaign entered the second half of the calendar with a trip to one of the traditional venues on the GP trail. Anstie came through a practice and qualification programme on Saturday with a promising sixth position on his works KX250F and had a decent pick of slots in the wide gate that leads down to a fast left-hand first curve. The 2014 GP of Belgium winner threaded through the corner submerged in the pack for the opening moto on Sunday run under cloudy skies but in higher temperatures compared to the autumnal conditions felt on Saturday. ‘99’ attacked the first corner in the first moto but had to cope with the hectic position-swapping and incidents of the opening lap ‘brawl’. Max was just inside the top twenty passing the chequered flag for the second circulation and then started an effective route through to a satisfactory eighth. Anstie got it right in the second moto. A perfectly executed holeshot and then some faultless laps pulled him clear of first race winner Tim Gajser and he opened the margin to around six seconds at one stage. A total of 38 points and the ‘25’ from the second race was enough for the second step of the box. The upshot of his efforts at Teutschenthal means that Max has accumulated 248 points for the season and now sits eighth in the MX2 table with eight Grand Prix and sixteen motos still to go. The fifth round of the Maxxis British Championship will take place next weekend at Blaxhall in Suffolk and will be the next fixture for Monster Energy DRT Kawasaki as Anstie continues his charge on the MX2 national series. He is currently just eight points behind Steven Lenoir but has not dropped out of the two for the last nine motos. The team will then move across the North Sea to Uddevalla for the Grand Prix of Sweden in the first week of July.